Ladies and gentlemen we have moved locations and you know what that means don’t you?…New area, new beers! It’s been a week and we have tried several already but this is the first one I have decided to post. The D9 brewing company, from Cornelius NC is our first beer in the new area and it is a hit! Labeled with different hops from around the world, pineapple, peach and citrus flavors to boot, this beer is quite tasty. A small “hoppy” bite at the end of the gulp, slight pineapple but you have to think about it and a light scent make this beer delicious. 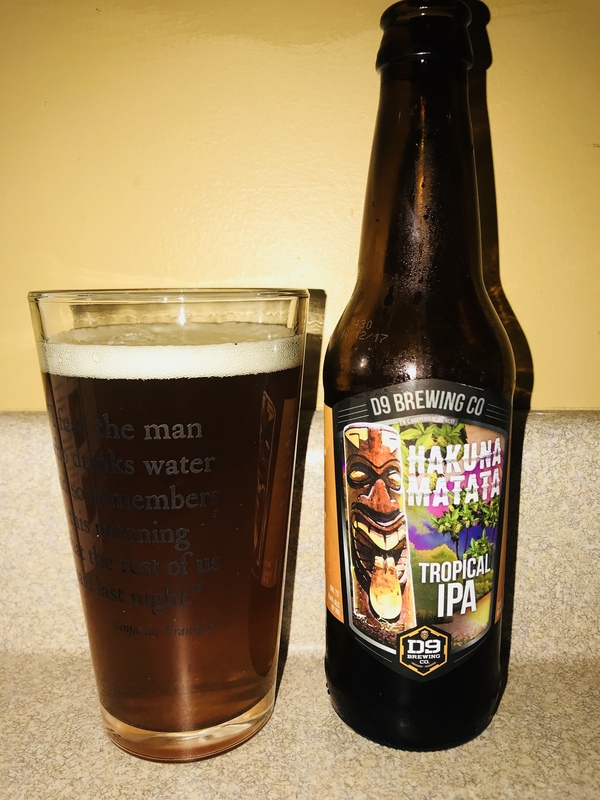 I am not an IPA fan but this is one I will definitely drink again. It also carries a 6.6% alc content which is above average and makes it easier to drink all night. Well done..3 stars, enjoy!